Police are treating an attack on a memorial to a IRA victim in south Armagh as a sectarian hate crime. Officers said criminal damage was caused to William Clarke’s memorial stone and plaque on the Carricknagavanagh Road, Mullaghbawn, between midnight and 8am on Saturday. Mr Clarke, a 31-year-old married father of three, was a digger driver who was abducted by the IRA and shot while digging drains at a farm in Mullaghbawn in April 1977. Despite IRA claims that he had paramilitary links, the SDLP, UUP, his widow and his Presbyterian minister all insisted he had none. Constable Jon McDonald said the total damage to the memorial was about £1,000. Police are treating the attack as a sectarian hate crime. Local UUP MLA Danny Kennedy and councillor David Taylor condemned the damage to the memorial, which had been erected “to an innocent Protestant civilian murdered by the IRA”. In a joint statement they described the attack as “disgusting and hurtful in the extreme to the widow and family circle of William Clarke, who was abducted and murdered in very cruel circumstances nearly 40 years ago”. Mr Taylor said the attack had caused great distress to the widow and members of the Clarke family, “who have suffered in silence since 1977 and borne their grief and loss with enormous dignity”. He appealed to the community to “ensure the memorial, when reinstated, would be respected in the future”. South Armagh victims’ campaigner Willie Frazer said Mr Clarke’s widow was verbally abused by locals driving back and forward past the memorial on the same evening as the attack took place. “They were shouting ‘up the RA’ and that sort of thing,” he said. He believes the attackers are trying to draw people in to attack republican memorials, which he urged nobody to do. 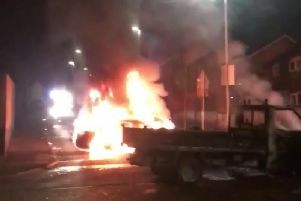 The number plates of the vehicles from which abuse was shouted were handed over to the police and they are treating it as a sectarian attack, he added.